Dr. Sanko Lewis currently resides in Korea. He specializes in Korean martial arts. He is an ITF Taekwon-Do 5th degree black belt, and was promoted by Grandmaster Park Jong Soo in 2014. He is also a Hapkido 4th degree black belt, issued by the Korean Hapkido Federation (KHF) in 2016, and received his master's certification from the KHF in 2017. He furthermore has formal training in Taekkyeon (Gyeollyeon Taekkyeon) and Yusul. Dr. Lewis has also trained informally or cross-trained in a variety of other martial arts, such as Yusul (Korean jujitsu) Brazilian Jiu-jitsu, Muay Thai, Tang Soo Do, Jeet Kune Do and Tai Chi Chuan. Dr. Lewis is founder and head of the Soo Shim Kwan, which is affiliated to South Africa Taekwon-Do Institute (SATI), and founder and co-head of the Mudo Academy (previously Potchefstroom Regional Academy). He was one of the founding members of the SA-ITF and acted on the SA-ITF National Council, the highest authority of the SA-ITF, from 2003 until 2015. He was also Director of RED (Research and Education Directorate) for the SA-ITF for nearly a decade; before which he acted as the SA-ITF’s Information Director. In 2016, Dr. Lewis re-established the South Africa Taekwon-Do Institute with the help of Instructors Karel Wethmar and Annari Wethmar. He wrote the first version of the SATI constitution and acts as SATI's Constitutional Director and Research-and-Education Director. Dr. Lewis lives in Seoul, South Korea and works as a literature professor at a university. He also teaches martial arts: primarily ITF Taekwon-Do with a self-defence focus and Hapkido. He occasionally gives Korean martial arts workshops that also includes elements from Taekkyeon and Yusul. Dr. Lewis graduated from Kyunghee University (South Korea) in 2016 with a PhD in Physical Education, Taekwondo (with research focus in Northeast Asian Philosophy and Martial Arts). He was awarded a certificate of excellence for his dissertation. Mr. Philip de Vos instructs the main dojang of the Soo Shim Kwan at the North West University, Potchefstroom, South Africa. He is also co-head of the Mudo Academy (previously Potchefstroom Regional Academy). Mr. de Vos represented South Africa during the 2013 World Championships in London, UK, where he was part of the teams that won silver for male team power breaking and bronze for male team special technique breaking. He is the MASA (Martial Arts South Africa) representative for SATI (South Africa Taekwon-Do Institute) since 2016. 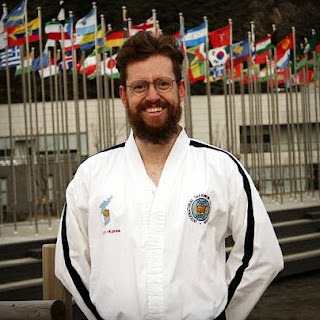 Mr. De Vos is a mechanical engineer by profession and therefore has a very technical understanding of the physics of Taekwon-Do, and applies this knowledge to power breaking in which he excels. Mr. De Vos tested for his red belt with Master Kim Jong-Chol (6th Dan at the time, currently 7th Dan), for his black stripe and 1st Dan with Master Kim Jong-Su (7th Dan at the time, currently 8th Dan) and tested for his 2nd Dan under Sabeomnim Karel Wethmar (5th Dan), one of South Africa's premier Taekwon-Do coaches. In 2014, Mr. De Vos was promoted to 3rd Dan by Grandmaster Hwang Kwang Sung, who was one of the first three grandmaster's promoted to 9th Dan by General Choi Hong-Hi. Instructor Nico Botha is instructor of the Bunjae Taekwon-Do School in Newcastle, KZN, South Africa. Instructor Botha started his martial arts career with Goju-Ryu Karate in 1993 and switched to Taekwon-Do in 1995, training under the late Instructor Sidney Swanepoel (a student of Mr Johan Bolton) and Chief-Instructor Johan Bolton. In 1997 he started teaching Taekwon-Do as an assistant instructor at various schools in the Vaal Triangle and participated in numerous Taekwon-Do tournaments and all styles competitions. Mr Botha was promoted to 1st Dan in Moo Duk Kwan Taekwon-Do under Mr Johan Bolton in 1998. In 1999, Mr Botha received a bodyguard diploma and self-defence certifications, and began working in personal security for VIPs and later began a career in surveillance in the casino industry. Mr Botha has assisted the South African Police Service in covert operations, and continued to expand his skill set with short courses, for instance a short course in Krav Maga. He also enjoys fitness training and spent several years competing in arm-wrestling. Mr. Gerhard Louw received his formative Taekwon-Do training in Vanderbijlpark under Mr Rudey Brittz, a black belt under Sabeomnim Johan Bolton. Mr. Louw had received provincial colours a number of times and was also once chosen to represent South Africa abroad, but unfortunately, because of personal reasons, he could not attend the event. He has many years of teaching experience and ran a number of successful clubs, the last of which was the Horangi Dojang 호랑이 도장 in Groblersdal, Limpopo, before he moved to Botswana. Ms. Yolandi Müller was one of the very first students of the Potchefstroom Dojang when it opened in 1998 and the first to receive a black belt. 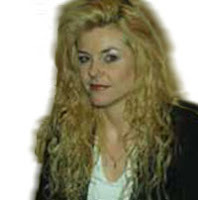 During her basic training she was the only person to have triple graded under Instructor Johan Bolton (4th Dan). For her 1st Dan in ITF Taekwon-Do, Ms. Yolandi Müller tested under Instructor Ged Mackell (4th Dan), the honorary president of the SA-ITF. Ms. Yolandi Müller acted as an assistant instructor for the Potchefstroom Dojang. She was also vice-academy head of the Potchefstroom Regional Federation, until its conversion into the Soo Shim Kwan. She was vice head of the Potchefstroom Regional Academy until its conversion into the Mudo Academy. During several years she functioned as a co-examiner for many of the Soo Shim Kwan colour belt promotion tests and still functions in an advisory capacity to the Soo Shim Kwan. Mr. Jaco du Bruyn is one of the original students of the Potchefstroom Dojang. 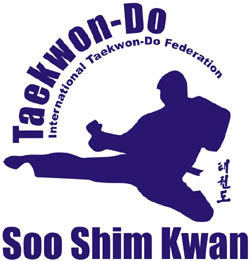 He is the second person to have received a black belt as a Soo Shim Kwan member. He tested for his 1st Dan in ITF Taekwon-Do under the honorary president of the SA-ITF, Instructor Ged Mackell (4th Dan). Mr. De Bruyn, who has a master’s degree in Etymology, was an assistant instructor at the Potchefstroom Dojang in 2002, then became the full time instructor for 2003 and the beginning of 2004. Instructor Daniel Jacobs received his 1st Dan in Scotland under Mr. Gordan Wallace (V Dan). Mr. Daniel Jacobs also acted as assistant instructor in Mr. Wallace's dojang. Mr. Wallace is the Technical Director of Scotland, which would explain Mr. Jacobs' technical perfectionism. Mr. Jacobs was head of the Northern Cape Academy, an academy affiliated to the Soo Shim Kwan, until he relocated to New Plymouth, New Zealand. Ms. Retha Fritz acted as an assistant instructor for the Potchefstroom Dojang on numerous occasions. She has also been highly active in administrative functions for the Soo Shim Kwan and Potchefstroom Regional Academy. Ms Fritz furthermore translated Taekwon-Do’s Theory of Power and Training Secrets into Afrikaans, a service that benefits a great portion of South Africa’s Taekwon-Do community. Mr. Charl du Plessis was an occasional assistant instructor at the Potchefstroom Dojang. He had many years of Karate experience before he decided to convert to Taekwon-Do. 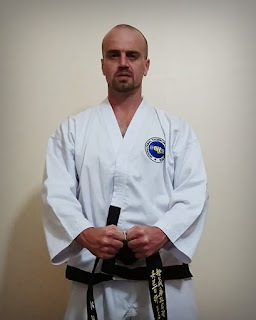 Mr. Stuward Rautenbach filled in as an assistant instructor for the Potchefstroom Dojang many times and although he is originally from the San Kwan (KwaZulu Natal) and trained primarily with the Vaal Taekwon-Do Academy, he is considered a much valued member of the Soo Shim Kwan. His basic instruction was from Instructor Garnet Ronander (4th Dan), a previous senior vice president of the SA-ITF and multiple SA-ITF National Champion. Mr. Rautenbach has various martial art interests, with special focus on pressure points. Mr. Werner de Bruyn functioned as an assistant instructor for the Potchefstroom Dojang for a period while studying at the North-West University. Although a member of the Vaal Taekwon-Do Academy, his input into Potchefstroom Regional Academy was much valued and students from the Potchefstroom Dojang spoke very highly of his instruction.